…Plaintiff in Dauda's case is latest victim The rumour mill has been set agog following the death of Nana Kofi Nsiah, a businessman, who dragged the former National Democratic Congress (NDC) parliamentarian for Asutifi South constituency, Alhaji Collins Dauda (pictured), to court over an alleged libel. Kofi Nsiah died in Kumasi on Monday, this week, a few minutes after complaining of dizziness. A report gathered from the Asutifi South constituency in the Brong Ahafo Region speaks of uneasiness among the citizens since the announcement of Kofi Nsiah's death. A source hinted that it was the third time that someone in competition with Alhaji Dauda had died, hence the alleged mystery. Reports are that supporters of both the New Patriotic Party (NPP) and the NDC are wondering what might have gone wrong. Prior to the 2000 elections, Professor Amoah, who returned from Zimbabwe and stood on the ticket of the NPP for the parliamentary seat, reportedly died mysteriously when he was allegedly 'slapped' by a vulture. His sudden death resulted in the postponement of that constituency's election. The NPP fielded the deceased's wife, Mrs. Cecelia Amoah, who became the eventual winner, snatching the seat from the NDC's Collins Dauda. Last year Kodjo Adams Mahama, who was coasting to become the NDC Brong Ahafo regional chairman unopposed, died in an accident. The former Member of Parliament (MP) has since become chairman of the party in the region. A few weeks ago the Deputy Minister of the Interior, Thomas Broni, reportedly said that Alhaji Dauda was not a Ghanaian. Collins was alleged to have gone to town on a Kumasi-based radio station and allegedly made defamatory statements, which Kofi Nsiah took offence at, hence his dragging Dauda to court. The case is yet to be heard. According to a news bulletin monitored on Adom FM yesterday, Alhaji Dauda has asked his supporters to remain calm against any extreme provocations or insinuations from their political opponents. 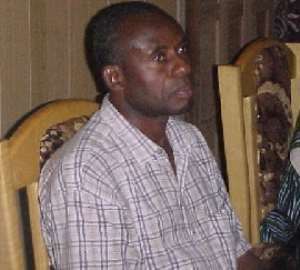 Collins Dauda went on to say that he was at Mehami in the Brong Ahafo Region on Sunday. The next day, he said, he was present in their hometown where Kofi Nsiah's sudden death was announced. That same evening, he left the town for Sunyani where the radio station contacted him. He went on to say that when Prof. Amoah died so much superstition was attributed to it but he ignored it. From Mehami, information reaching The Chronicle indicated that some uneasiness was being experienced and unsubstantiated reports were that a section of the citizens were pushing for sanctions against the return of Alhaji Collins Dauda to the town. The Chronicle learnt when Adom FM reached Dauda on that issue, he stated that there was no such statement from any quarters because he remained in touch with his supporters on the ground. He went on to say that he would continue to go to Mehami, so long as the place remained his hometown.